Euro containers are heavy duty plastic euro boxes that stack for maximum volume. A euro container is a plastic storage tray, stacking container, sometimes called a euro box or euro crate. They are plastic modular inter-stacking containers with vertical sides for maximum internal volume and were the first reusable plastic box to replace cardboard. They are designed to fit on european size 1200 x 800mm and 800 x 600mm wooden and plastic pallets, as well as standard 1200 x 1000mm pallets. They are used for storage and product movement from goods in, through manufacturing, storage and right through to despatch at the far end. Euro stacking containers, or stackable euro containers, are a type of versatile storage tray made of plastic that can also come with lids. 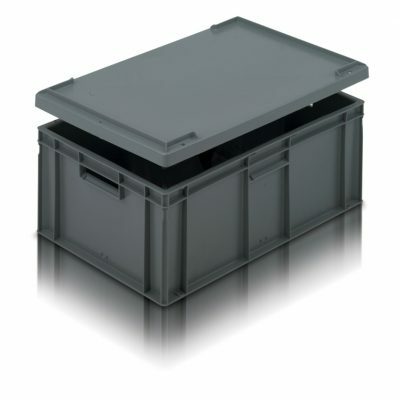 Our euro boxes offer a number of footprints from 300x200mm to 800x600mm with multiple heights. We have heavy duty euro containers, euro containers with lids attached and colour coded euro containers. Our containers can be tailored to suit your requirements with lids, inner dividers, label clips and personalised print. Euro sized dollies are available for easy transportation of containers. Our customers come from various industries and thus we understand how their needs vary. Therefore, we provide Euro stacking containers, which are available in various types that can serve many purposes in different areas. Warehouse organisation, product distribution, van storage, home/garage, fisheries, offices as well as homes and automated conveyors can use heavy duty euro containers. Euro crates can be used as drip or spill trays and are the best trays to keep food produce. Bakeries can make use of our euro crates to stock their baked food and also use it for keeping their bread dough. Racking these crates is safe when transporting food from one place to another as they are hygienic food trays, which can suit your requirements, since they come with lids and multiple dividers. Euro stacking containers are best options for stacking maximum volume. The suffix “Euro” refers to the fact that the containers are a standard European size. We supply euro containers in three standard footprints (length x width) 200 x 300mm, 400 x 300mm, 600 x 400mm and 800 x 600mm. Each footprint size is available in a range of boxes with different depths that can all be stacked together. Our euro containers are designed to fit on European size of 1200 x 800mm and 800 x 600mm wooden and plastic pallets. Also, we have the standard sized plastic pallet which to be precise are sized 1200 x 1000mm pallets. These sizes have become a European standard and were originally configured to stack efficiently on a standard UK (1200 x 1000) or a standard European (1200 x 800mm) pallet. This feature of stacking ensures efficient storage and transportation of the boxes. 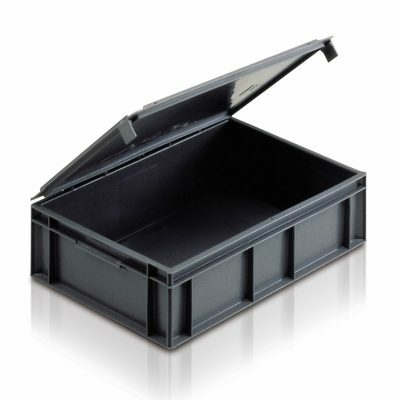 Our euro boxes offer a number of footprints from 300x200mm to 800x600mm with multiple heights. Also, Euro boxes with different foot prints can be stacked together; for example, two of the 600 x 400mm boxes would securely stack on one 800 x 600mm tray. Euro crates are highly useful as stackable boxes for many applications, one of the most widely and commonly used storage tool in the catering industry. The euro containers are food grade and are used for engineering trade as well as in bars and restaurants. We have solid euro containers and ventilated or perforated euro stacking containers as well. We understand and prioritise safety of our client’s valuable goods and hence our plastic containers are designed with lids attached to them. Our stacking containers can be tailored to suit your requirements with lids, inner dividers, label clips and personalised print. Euro sized dollies are available for easy transportation of containers. How is euro containers and crates the best stacking container? Euro stacking containers are made plastic modular inter-stacking containers. As our product is made from plastic, it assists the users for easy movement and shuffling the storage containers becomes easy. Also, the product is designed as such that the fitting with vertical sides is such that it provides the user with maximum internal volume. Plastic euro stacking containers are practical storage solutions used in many workplaces for storage, distribution and handling needs. We specialise in providing these plastic stacking containers in variety of sizes ranging from 10 to 125 litre capacities. These heavy duty storage boxes are well suited for industrial environments and are designed to provide a long lasting storage and handling solution. They can also be combined with our stack nest containers and stackable storage bins to have an ultimate storage solution in place for all kind of industries. Our euro crates and euro containers meet the requirements of our customers and provide valuable stacking solutions, rescuing our clients from space constraint while storage. Our containers are produced from High-density polyethylene (HDPE), which is a hard wearing plastic. 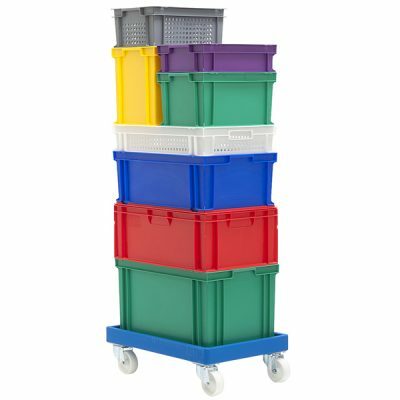 These heavy duty euro stack containers are durable, like our tote boxes, making them ideal to be used in different workspaces and applications including factories, warehouses, storerooms, retail, distribution and elsewhere. The plastic body means the euro stacking containers are water resistant and can be used in both wet and damp environments. This also allows them to be simply washed out or cleaned in automated tray washes, without any worries of rusting or corrosion. Since the plastic used in manufacturing these containers is certified virgin material, it is even safe for food contact. For this reason our euro stacking containers are also a popular choice for all types of storage needs in food production industries. Other than this, our boxes have numerous holes in them. This maintains great ventilation in them which keeps their contents fresh and free from any kind of odour. We are responsible citizens working towards maintaining our environment. Thus, using a product, which is 100% recyclable, leaves no room for waste and of course, gives you a sense of pride as well because you are contributing towards helping the world by reducing your carbon footprint. Not just that, our boxes are recyclable and thus they are of optimal benefit to you when they are no more useful to you. The design of the product is always worth considering. Our euro stacking containers are easy to handle, and efficient for order picking. We make these boxes easy to handle because we know how effective it is to have a box that you can easily pull, push or carry when it is loaded with heavy weight. To retain the quality of product in optimal condition we have in them numerous ventilation holes keep your product in optimal condition. These containers are inter-stackable, within various types of packaging and have the complete potential to withstand heavy loads. Our euro crates are totally customer friendly and therefore have four handgrips and a sliding base but no harsh movements. It is easily foldable and it folds and unfolds in couple of seconds. Our product definitely assures larger internal volume and consequently, more product capacity. Plus the standard size of the euro containers makes it easy for individual shelf distribution. The euro containers gives up to 74% volume reduction when folded, thus providing us with the efficiency for storage and transport. It is also ideal for use in fully automated systems and suited for automatic order picking. The numerous qualities make our euro stacking containers very useful and beneficial. We understand your packing requirements and have managed to create a line-up, which will be able to deliver the perfect euro crates or euro stacking containers. Our Euro containers are efficient storage solution for your desired location. 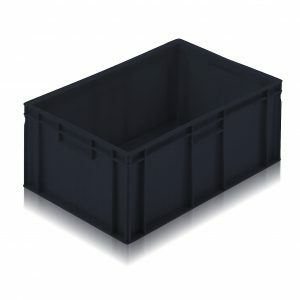 Maintaining an unrivalled stock of containers and crates for various individual applications, we offer different types of euro containers to our customers, a wide range, with their own unique set of benefits. This is the ideal container to use when transiting due to the excellent security smart hinged lid. The smooth and flat bases of the euro containers give silent conveyer movement. The Hinged Lid euro containers are designed to be stacked one inside the other and their vertical sides allows a maximum usable volume. These euro containers are perfect to pack valuables as they are smooth walled and have a sturdy case. We are proud to ensure that your possessions will be safe and out of harm’s way, because of the present heavy duty handles and sliding clasp locks. Food industries invest on a good quality euro container as it is deal for catering and food use, due to the good quality material and their ability to keep the food produce hygienic. Our ventilated containers allow a constant and natural air flow -perfect for goods transported in temperature controlled vans. Our range of stacking containers is available in a variety of dimensions. It will hold up to a load capacity of up to 60kg per box, which shows the durable quality of the euro conditioners. It is suitable for both hot and cold environments, as it can withstand temperatures of -20°C to 100°C. The food grade plastic construction is good and this high quality range of plastic containers is resistant to acids and oils. Transporting heavy loads is not an easy task and we understand that. Therefore, we back up euro stacking containers, which are ideal choice for transporting heavy loads, as it has reinforced corners. Wide rims and ergonomic hand grips, assures that our euro crates can be handled with ease. If, structural integrity and security are your main concerns, these boxes are the ideal choice. You can opt for colour-coordinated euro stacking containers, when you wish to distinguish between your goods and materials. Our colour coded stacking boxes and lids will assist you in keeping a tab on the various boxes and you will be easily able to tell your contents apart. Vertical sides allows maximum usable space and smooth, flat bases ensure silent conveyer movement, this is similar trait in all types of euro containers.